Given they’re just toys, Nerf’s blasters aren’t really known for accuracy. The best approach has always been to just send as many darts as possible at your target to improve your chances of hitting it. But with Nerf’s new Accustrike line, precision, patience, and aiming are finally the better approach. So what makes the Accustrike blasters—arriving sometime in the Spring of 2017—more accurate? It’s actually the Accustrike darts that are the secret to the improved precision. Nerf’s designers spent over two years on the new design, which features better balance and weight distribution, but also a radically redesigned tip for improved airflow and aerodynamics. You’ll still need to carefully line up your target through your blaster’s sights, but the new Accustrike darts now fly through the air with better stability, which means they’re less likely to drift off course and miss your target. They also work with any blaster that’s compatible with the brand’s Elite darts, but Nerf is also introducing four new blasters under the Accustrike branding. At the top of the Accustrike food chain is the new $30 N-Strike Elite Alphahawk blaster featuring a bolt-action slide mechanism for reloading and a five-shot rotating drum. Instead of throwing a steady stream of darts at your opponents, you can use the blaster’s integrated sight and stock for steadying your aim to find yourself a nice safe place to camp and simply wait until your targets pass through your crosshairs. 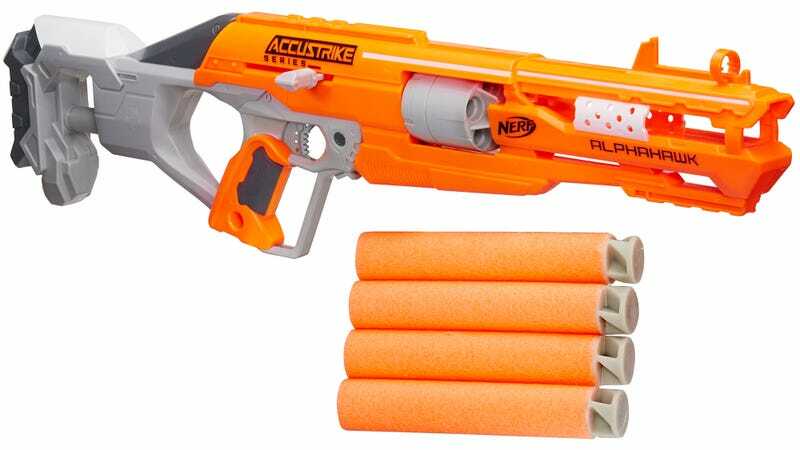 Following the Alphahawk is the cheaper $15 Nerf N-Strike Elite Falconfire blaster which comes with six of the redesigned Accustrike darts, storage for two extra rounds in the bottom, but just a single-shot capacity. As a result, you’ll need to make sure that every dart you fire counts, but with an integrated sight and the improved accuracy of the Accustrike line, the odds will definitely be in your favor. Nerf’s Rebelle line is designed to show girls they can be just as much a nuisance with a blaster in hand as boys can, and the $20 Focusfire Crossbow is the first to come with the new Accustrike darts. A handle on top is used to prime the crossbow, which features a five-shot spinning drum on the front that automatically reloads after each attack. With a $10 price point you’d assume the Rebelle Truepoint blaster would be as no frills as it gets as far as all the new Nerf Accustrike blasters go. It does only have a one-shot capacity, requiring a manual reload every time you fire it. But it’s the only blaster in the line that also fires a red beam to make it easier to hit your target. It’s not an actual laser, that wouldn’t exactly be safe for kids, but it will give you an advantage the next time your Nerf battle continues on well after the sun sets.